ABOVE: The Hotel de l'Europe glows at twilight. This luxury hotel has catered to the rich and famous since 1867. 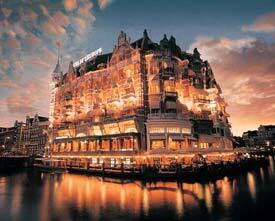 Its historic building overlooks the Amstel River. Service and intimacy are the focus here. The hotel has only 111 rooms, an elegant 19th Century decor, and enough modern amenities so you won't think you've been trapped in the Victorian Era. With 468 rooms and a location facing the Royal Palace, the Grand Hotel Krasnapolsky is favored by upscale tours and business groups. The hotel has two restaurants, a fitness center, and the Golden Palm Bar. This 270-room hotel is built behind the fa�ades of 19 historic buildings from the 17th and 18th Centuries. Many of its rooms incorporate the original oak beams and rafters. The Barbizon Palace is located across the street from Centraal Station, and you can park in the underground garage or arrive by boat at the private landing. Two canals frame the Pulitzer, which has 230 rooms, suites, and apartments in 24 restored 17th and 18th Century houses. The hotel has a garden, many rooms have oak ceiling beams, and all bathrooms feature heated marble floors. The former Apollo Pavilion opened in 1928, when Amsterdam hosted the Olympic Games. It became a hotel in 1962, and today it offers 223 rooms and suites plus assorted bars and restaurants. It's located in the Museum Quarter, just beyond the city center.